What Is The Best Traveling Flashlight? If you're a person on the move, you're going to need a flashlight that can travel just as well as you do. Features that we've looked for in a travel flashlight are compact size, recharging function and operation style. Depending on how you're traveling you may want a standard EDC, a hands-free headlamp or a camping style lantern - make sure to consider your unique activities when choosing! 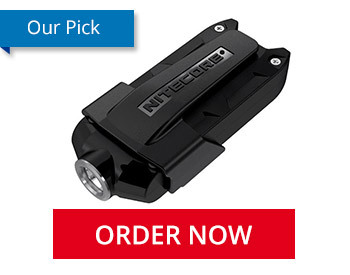 That being said we've tested some of the best lights in the industry, and here's our pick. Out of all the lights we tested, we found the Nitecore TIP to be the most versatile when it comes to travel. As a keylight it comes in a compact size and a clasp that can be used to attach it to keys, a backpack or clothing. The 2017 version of the TIP also comes with a beefy plastic clip that can be used for carrying the light or hands-free use. A respectable 360 lumen output should cover your everyday lighting needs, but if you're looking for more power an EDC like the Olight S1R Turbo may suit you better. The TIP is USB rechargeable, and can be powered up just about anywhere which is a big benefit if your on the road or on an extended trip. An integrated battery pack keeps clutter down too, no need to fuss with a separate battery. If you prefer lights with integrated battery packs and are looking for a strictly hands-free approach, check out the Nitecore NU10, a lightweight headlamp that satisfies all of our travel light criteria. The TIP is great, but it may not be the perfect choice for you! Below you'll find a carefully curated list of our very best travel flashlights tried and tested by us, the flashlight experts. Consider a headlamp for hands free use, or a lantern style light for cozy area lighting. If you're heading out on vacation or just hitting the open road, it never hurts to have the best travel flashlight by your side. A light can be used for late night navigation and map checking, self defense and emergency signaling. The best flashlight for travelling will have some common features including compact size, long runtimes and the ability to recharged wherever a power source can be found. Our curated selection includes just that, with representatives from both EDC and keychain style lights. Keep an eye out for flashlights that run on both rechargeable and primary batteries, as it is always a good idea to keep back up power on hand! Need a hand picking the best travel flashlight for you? We've got your back with highlighted products and a list of our favorites right here!